Some of this will be a rehash of my other post on Spirit Realty Capital (SRC) from January, but today SRC released the Form 10-12 for their spinoff, Spirit MTA REIT (SMTA), its a fun structure that deserves a little more fleshing out as it could result in an interesting investment opportunity once it starts trading in the second quarter. As a refresh, SRC is a triple net lease REIT primarily focused on single tenant retailers that needs to rid itself of its largest and most troubled tenant, Shopko, in order to increase its valuation to the point where it can raise capital again (a must for any REIT). SRC is hoping to accomplish this by spinning off its Shopko properties (and other workout assets) into SMTA but this would only work if SRC could receive proceeds in return -- here's where their securitization vehicle, Master Trust 2014, comes into play. Master Trust 2014 is an SPV that houses many of SRC's small-to-middle market tenants that are unrated (but not Shopko or the other workout assets), and uses the SPV to obtained financing secured by the leases pledged to the SPV. By putting the leases in the SPV, Spirit is able to obtain favorable financing terms such as being able to leverage the SPV up to 75% loan-to-value. As the Master Trust has amortized over the last few years, the SPV had become overcollateralized, by putting the Master Trust with the spinoff, Spirit was able to put additional debt on SMTA and return it to SRC, in essence they're able to effectively "sell" the Shopko/workout assets by spinning it off with a cash out refinancing of the Master Trust SPV. Of course they could have done the cash out refinancing of Master Trust 2014 anyway, but that would have increased SRC's leverage ratio and likely wouldn't have made their equity valuation any higher with Shopko stuck at the top of their rent roll. But by positioning the spinoff as a highly levered REIT, they're able to rid themselves of Shopko and receive precious dry powder in return. The basic strategy will be to sell off or redevelop the Shopko assets and put the cash/collateral into Master Trust 2014, issue notes against it at 75% LTV and run a very leveraged REIT that looks more like a mREIT or CDO structure of yesteryear. 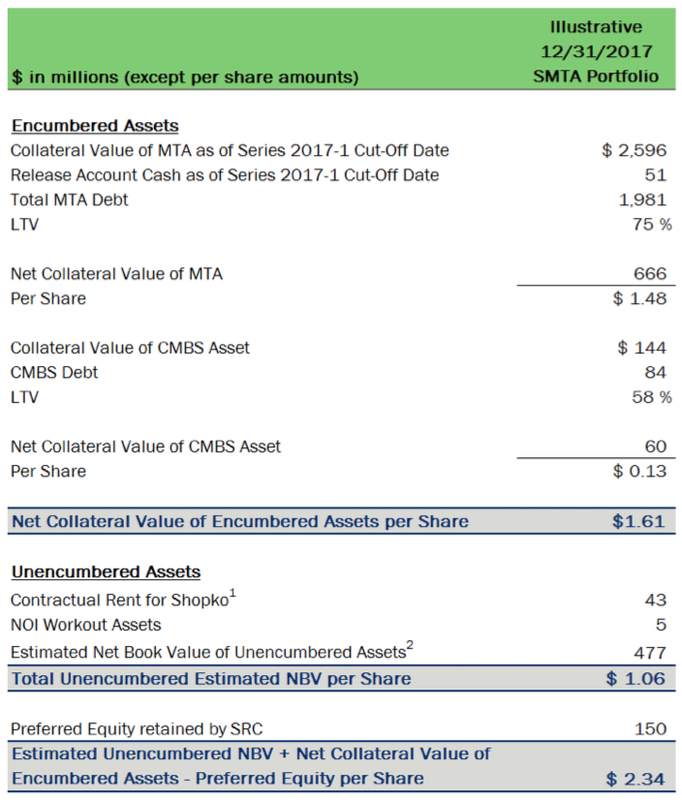 Coming out of the spinoff, SMTA will be leveraged 9.2x, but if all goes as planned, the leverage will climb significantly as Shopko makes up 20% of contractual rent and all of those properties are unencumbered. As these assets are sold, the leverage will increase substantially to something like 12x EBITDA at the end state, or about double any traditional net lease REIT. SRC mentioned on their recent earnings call that SMTA would have a very high payout ratio, I take this to mean it'll likely be at or above FFO, here's a little back of the envelope calculation of where cash available for distribution could be before any non-cash charges like impairments or loan loss reserves. Please alert me if there are errors, likely I've made a few, but I think it's directionally right, and then below is the potential accretion if SMTA sells their Shopko/workout portfolio at various levels of their stated "Real Estate Investment Value" of $646MM per the Form 10. *Revised from the original, I only had the debt proceeds and not the cash sale proceeds being reinvested originally. Some feedback I heard on my comparison of SRC to STOR was "well, STORE Capital's secret sauce is they get unit level financials and run their own internal ratings to monitor their tenants", the tenants in Master Trust 2014 are the same, 98% provide unit level financials and SRC utilizes Moody's to provide shadow ratings on all their borrowers. I contend this is a commoditized industry and there is very little secret sauce or competitive advantage, other than the "shares are really your product" marketing to equity investors concept and lowering their cost of capital. Fraudulent conveyance was also brought up, but in this structure the secured lenders in the Master Trust and one CMBS asset aren't being impacted by the spinoff directly, their notes are secured by the pools of leases in each SPV. Even if Shopko went bust immediately after the spinoff, the debt holders of both SPVs wouldn't be impacted. Which isn't to say the equity of SMTA being worth zero isn't a risk, clearly a recession or continued weakness in traditional retail (40% of SMTA's rent, 50% of that 40% is Shopko) will eat away at the equity strip of the SPVs and the value of the workout assets. SRC will be the external manager, they're charging a flat $20MM plus a promote in the out years, $20MM works out to be about 2% of the equity NAV they laid out in their Path Forward III presentation slide below. Not fantastic, but it is fixed, so as SMTA moves along in its recycling program the base management fee will remain the same providing some operational leverage (of course could go the other way too). SRC and SMTA will have overlapping investment strategies, high level SRC wants to pursue the more investment grade rated tenants and SMTA will focus on the smaller non-rated tenants, but I'm sure there will be times when SRC has to decide which portfolio a prospective investment should go and it likely won't often be advantageous to SMTA. SRC's recent $35MM term loan to Shopko will be "contributed" to the spinoff, it's included in their workout portfolio numbers, the coupon is 12% and is very likely to end up in some kind of restructuring before it matures in 2020. Here's the old sum-of-the parts slide, I think the only changes are in the workout portfolio bucket, SRC must have contributed additional properties as the value moved to $646MM in the Form 10 versus $477MM below. Using the new workout number, the NAV should be $3.05/share, it won't trade there but I think it's an important reference point. If my CAD number is correct, and SMTA trades like one of the ugly Class B/C mall REITs with a 15+% dividend yield, then the shares could be worth $1.50 per share of SRC. $1.50 is also about the value of the equity strip in the Master Trust SPV, as part of the refinancing, the collateral was reappraised and presumably the debt holders and rating agencies signed off on the new market value. Certainly not something to be given too much faith, but another reference point. I expect SMTA to be incredibly volatile those first few days of trading as many of SRC's traditional retail shareholders are likely to dump the stock, keep it on your watchlist! Hi, great blog, the best I have found to date. I am also long SRC. I was wondering if you would post on your experience with call options when it comes to spinoffs. I have never invested in options but I can see why there might be opportunity here, similar to Greenblatts eg of Marriott International and Host Marriott in YCBASMG. People will be waiting to buy SRC, SMTA is highly leveraged and will be small compared to SRC. Of course options are risky so only a small % of portfolio should be invested in them. Do you typically invest in options that are weeks or months in the future? What has been your success rate? Any thoughts on SRC options? Thanks in advance. 1) Here I expect the spinoff to "force" the market to put some value on SMTA where its seemingly putting very little value on the Shopko assets today. SMTA can't trade below $0. The event helps put some box around the timing issue with options, doesn't always, but it helps me mentally pick an expiration date (here I own $8 July calls). From the sounds of it, the company is still expecting an early second quarter spin date, that gives the market a month or two to re-value SRC/SMTA somewhat before my options expire. I expect the full re-valuation at SRC to take longer as they'll need to restart their lease acquisition engine and grow FFO before the market gives them too much credit. 2) Maybe I was a little hasty, my cost basis in SRC is around $8.50 and when it fell with the recent move in rates I wanted to average down. But I also like the SMTA spin more than most I'm assuming, it's going to be a small piece of the total, so my current thought is if my calls are in the money at expiration, I'll sell down the SRC side of the spin and keep the SMTA, use the calls as almost a way to get more of SMTA "for free" now. Some mental accounting there, but its worked for me in the past. Most of the time I don't use options around spinoffs, but I'm usually successful when I do, "maybe" its because classic options pricing models usually use backwards looking volatility to price the options today, not taking into account the event that will cause significant volatility in the future? That's the best I can come up with, especially for relatively small companies like SRC that don't have significant options volume. What is your opinion on DDR? It has the same dynamic where they are spinning the "bad assets" away from the company. The market completely wrote off the "bad assets" that is worth at least something. I haven't looked at it enough to comment, its near the top of my list to research as I know the purpose of the spinoff is similar to SRC. I'll come back if I have anything useful to say, thanks. MDC -- I enjoy your thought process. As the largest component of SMTA, do you have any more tangible valuation barometers for a publicly traded master trust? Private trades might prove a helpful yardstick, too -- I haven't come across much of either. A master trust is just a funding mechanism, STORE Capital for instance uses master trusts extensively in their capital structure as well, so its not a unique structure to SRC/SMTA. But because all the leases are put into an SPV, they're able to get more financing at better terms than they could in an unsecured offering. I wouldn't get too hung up on changing any valuation techniques because the assets are inside a master trust. Thanks and hope this helps a bit. I have owned a number of tax free spinoffs over the years but I understand this one will be taxable. I am completely ignorant here, how does the taxable event occur? Hopefully someone more knowledgeable than me chimes in as well, but I believe we need to wait until the first day of trading to know the taxable impact. The taxable piece will be on the value of SMTA over the current and accumulated earnings and profits allocable to SMTA, which I don't think we know either. Unless I'm way off and SMTA trades at a high valuation on day 1, I expect the actual taxable impact to shareholders to be minimal. Thanks for your response. Im confident this is a stupid question but here goes, so its not like we need to tell the tax man rather some tax will be automatically shaved off our holding of smta when we get it? No, unless you're a non-US holder, I don't believe there will be any withholding. Your broker will tell the tax man, but I think it's too early to know the exact impact yet. In the revised form 10 the $646M changed to $649M and 110 unencumbered properties changed to 109. However in the investor presentation from March 5th (a day before the initial form 10 was released), the unencumbered assets has a NET BOOK VALUE of $477M. In the form 10 the $649M figure is described as REAL ESTATE INVESTMENT VALUE. It sounds about the same to me as net book value, however could it really mean net book value before depreciation and or writeoffs??? I think this interpretation makes more sense than the theory that more assets were added. Do you have any thoughts on that MDC? You're right, good catch. In form 10 "Real Estate Investment Value" is defined as "The gross acquisition cost, including capitalized transaction costs, plus improvements and less impairments, if any". Depreciation is a bit tricky in a triple net lease, the tenant is responsible for the upkeep and capex of the property, but at the same time the value of the structure at the end of the lease is usually minimal. Thanks for the clarification there, I'm still very interested in the "junk trunk" and hoping it to buy it for the value of the equity strip in the MTA. I have a feeling it will start trading for way lower. My guess is around $1/share. I think that's the right approach, SMTA will probably trade similarly to the junk mall REITs, at least until they make progress disposing the Shopko assets. Appreciate the hard work and effort you put into all your write-ups, MDC, great work here, especially. Just curious how you are reconciling the difference between the pro-forma Balance sheet from the Form 10 and the "illustrative" SOTP from SRC's presentation. Based on the asset values they presented in their presentation, I agree with your conclusion entirely. However, I am unable to come close to their presentation numbers based on what they show in the Form 10. Giving full credit to their equity(which undoubtedly needs a major haircut), including intangibles, i can only get to $229mn of equity, divided by approx. 42.85mn shares leaves me with about $5.34 a share. If I add back the $560mn in depreciation(should I be doing this? ), this leaves approx. $18.40. This still isn't even close to their presentation(Collateral value of MTA: $666mn, Collateral value of CMBS: $60mn, est. BV of unencumbered assets: $477mn) total of $1203mn, subtracting $150mn for the Prefs, leaves $1,053mn. Dividing this by 42.85mn shares leaves me approx. $24.5 per share. Is it because book value(held at historical cost) is not the same as collateral value? Are we just supposed to trust the banks refinancing appraisal(from Oct) or is there another way to calculate what the assets are really worth? Yes - that's going to be most of it, as part of the refinancing of the master trust, the collateral was reassessed and the presentation is using those values. Rates have moved in the time since and retail continues to struggle, so one can argue that the value of the collateral inside the master trust has decreased since. Thank you, appreciate the help. CBL & WPG, I'm sure there are others too. Thanks for posting. I'm sorry, what is CAD/share? Cash Available for Distribution, or some people use DCF for Distributable Cash Flow, more of an MLP non-GAAP metric, but the concept will be the same here as SMTA is going to distribute just about everything out to shareholders. That's true, but the promote is still pretty focused on long term performance, I think SMTA either works out great or completely flames out, don't know if there's a lot in between where the initial dump's impact on the incentive fee is going to matter much? One update -- in the latest Form 10, they disclose a CAD metric of $46MM, the major difference is the mandatory amortization schedule they have on the Master Trust notes. I'll be curious how the market values this cash flow and whether it gives them credit, or just values it based on a dividend yield, if its just a dividend yield play out of the gate, then this could trade even lower than I anticipated above. But I think the valuation range could be something like on the low side: 75% of the equity in MTA and the CMBS; to on the high side: 75% of the MTA & CMBS equity plus 50% of the value of the Shopko/workout assets giving no credit to any seller financing they might be providing as they sell these. Also note the distribution ratio has been announced, 1 SMTA share for every 10 SRC shares. I keep forgetting to mention the preferred, but you need to subtract $150MM from the value for those as well. Using the above methodology I'm getting a value of $9.20 to $14.76 per new SMTA share. Assuming 100% of the $46mm CAD is used for dividends but assuming a high demanded yield, we could see some low pricing for SMTA if valued on a dividend yield basis. I am curious about your comment above: "I'll be curious how the market values this cash flow and whether it gives them credit, or just values it based on a dividend yield". When you say "give them credit" what are you referring to? Do you mean credit for the underlying asset value, as opposed to just the dividend yield? Thanks. And thanks again for your write ups and comments. Yep, pretty much. If its based on a dividend yield, could be pretty cheap since the amortization schedule is siphoning off funds that could otherwise be paid out to equity, but the underlying value of the collateral would still be the same. But counterpoint, with something like SMTA, might be better to get dividends in your hands early than have the cash trapped inside the REIT. "Were Shopko to completely default on its lease payments, our pro forma Adjusted Debt to Adjusted EBITDA ratio as of December 31, 2017 would have been 12.0x, our pro forma Adjusted Debt + Preferred to Adjusted EBITDA ratio would have been 13.0x and our pro forma Fixed Charge Coverage Ratio would have been 1.4x. As you point out, it is unlikely Shopko would completely default - though they might renegotiate thereby lowering lease payments, but still greater than $0. "Our pro forma Fixed Charge Coverage Ratio does not reflect the impact of our amortizing debt principal payments"
Right. At that point its just the MTA. I don't think I'd want to pay $20MM annually for just the MTA equity, when the MTA is already paying a management fee within the securitization vehicle. Has management committed to maintaining the pre-spin dividend? I haven't found any information on this. Thanks! I haven't seen anything specifically, but I'd guess the combined dividends will be roughly the same as the pre-spin dividend on a dollar for dollar basis. If they ended up with a lower dividend and it upset the market, i.e. the spinoff being labeled as a backdoor dividend cut, then I'd likely be interested in adding to my position as it doesn't change the underlying value of the company. Thanks. Yeah, that’s not great, but the lease is in effect senior to the term loan? But yeah, just sort of swagging the workout/Shopko assets at 0-50% hopefully should provide some margin on the other assets too. Yes and no. As a going concern they need to pay the lease. In BK its exucatory and can be rejected. At 79 which is +1000 over BK risk is possible. Retail asset also. That being said as a distribution center much better than a store lease in any for assumption of lease in a Chapter 11. Quick one - I see you own call options... but there's nothing beyond October expiry. What is the thought here? Is it that most of the value sits in SRC and it should start trading up and it therefore doesn't matter if the garbage barge goes down initially? Or do you simply intend to roll if the two stocks don't go anywhere post spin for a few months? I hope that SRC re-rates enough that it almost doesn’t matter how poorly SMTA trades. SMTA is a fun riddle, but the meaty part of the thesis pre-spin is that SRC should earn a better multiple once the Shopko assets are gone. I own the July calls, not a lot of time for the market to value both sides, but I think we get at least part of the way there. Fundamentally seems like a great price, but right, could be some wild trading, really no clue where it could go. But I think you'll be happy stashing it away with an $8 cost basis. The spinoff is taxable with the distribution amount being the average of the first day price. I could be wrong, but I believe most of the distribution will be a return of capital. As a REIT, SRC is distributing more than its taxable income in a year, some of their dividend is a return of capital, so there's likely little embedded gains here being distributed. But those with a stronger tax/accounting background please chime in! Good stuff, MDC! It is nice learning your methods by comparing your posts with the original documents and seeing how you approached the matter. I suppose at today's prices you could lock-in about $1/share for Newco, maybe it'll trade even cheaper once the distribution happens. I think that's a fairly attractive price, seems like everyone wants to wait for it to sell off post spin, so maybe it won't? What's the right multiple of stated NAV? $9/10 seems like a good buy to me, but everyone is waiting for it to go to $6. Sorry for the ignorance. How do we reconcile the SMTA/WI quoted price of $9.5 to the $0.95 pre spin share count? The distribution ratio is 1 share of SMTA for every 10 shares of SRC you own. Thanks MDC. Excellent write-up by the way. Much appreciated. Hi, what do you think about insider compensation with SMTA? i can see that they have reserved approx 8% of shares outstanding for compensation. Greenblatt says this is one of the most important things to look at with a spinoff, to see what the insiders are doing. In some examples in his book the reserved %'s are 12 or 20%. Any thoughts? Thanks. Seems pretty typical, I think I usually see 10%, plus here you have the promote to SRC, that functions similarly as an incentive for management to see SMTA do well. SRC is probably worth at least $8.40 (that's 12x FFO) and SMTA is $0.90-$1.00 per SRC share, so about $9.50 total today with gradual upside coming from SRC re-rating over time. I could see SRC being acquired if the valuation doesn't perk up closer to peers in the next 12-18 months. Wow that's way lower than I expected. Is there any reason why you have lowered your fair value estimate from $9.75 just couple of months ago? Peers are trading at 7% FFO Yield and 5.50% dividend yield. Thanks! Sorry - no real change. Just don't think the market will give SRC full credit immediately, I think I've always said it will take some time for the market to re-rate SRC closer to peers. So the $9.75 number is more of a longer term target, versus I think SRC should trade for $8.40 today versus the $7.75 or so it's trading when issued. Yes and No, depends on your time horizon, $9 is a pretty good price if you feel okay about the $1.50 equity inside the Master Trust regardless of the CAD which is being reduced because of the amortization schedule within the Master Trust. But yes, short term, could really go anywhere? Safe answer, but I think $9 will look like a good price in 2-3 years. Do you know when the options for the spinoff start trading? Sorry, I don't. But SMTA is almost like an option already. Share count is 42.85MM, cash available for distribution last year was $46MM, if they distribute that out to shareholders in a dividend, that's $1.07/share, at Friday's close of $9.12 that's a 11.7% dividend. The MTA's equity was marked at $666MM as of 12/31, subtract the $150MM preferred and you get a "NAV" of the MTA equity of $516MM. 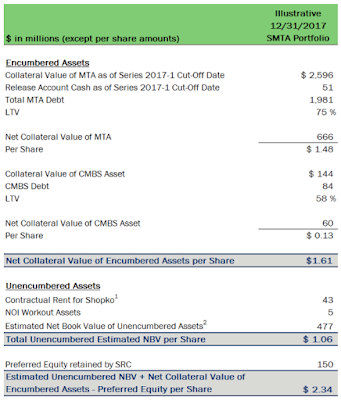 SMTA's market cap is $390MM, so you're effectively paying 75% of this MTA "NAV" plus you get roughly ~$500MM in value (feel free to haircut this as you wish) for the workout assets and the Academy Sports CMBS equity. Seems rather compelling? Yeah, it's odd, maybe a mistake? They should have plenty of liquidity post spinoff, but you'd think covering your dividend is important to gaining the valuation uplift too. Is it possible that the guidance was lowballed and they already levered up and bought back so much stock that they cover the 0.72$ dividend with AFFO now? Does the math work? Seems like a stretch. I'm guessing its a backward looking dividend and they didn't want to issue a stub dividend, next quarter they'll lower it to the going forward run rate. But I like your explanation if possible! Frommi - here's hoping you are right...i have a call into IR to ask the share count used for the per share dividend calc and I will report back. As for the backward looking dividend, could that be the case with a post spin record date? Sure, why not? If SMTA doesn't declare a stub dividend for this period, then the boo birds will be out about how this spinoff was a "backdoor dividend cut". well, let me re-phrase. If SRC can pay the $0.18 without dipping into the guided 2018 SMTA CAD, then it makes more sense. I just would be surprised if 1/12 (June's) SMTA CAD effectively was used to pay a post-spin dividend to SRC shareholders. Right, it's not coming directly from SMTA, but indirectly from the capital raise SRC did at SMTA, they have plenty of liquidity to pay it. The annualized language is a little strange, makes it seem like that's the dividend going forward as well. yes, i am wondering what SRC shareholders will think in Q3 2018 when it is closer to $0.50 annualized - at least based on Path Forward III ($0.65 x 75% payout). How do you account for the management fees in NAV? I don’t think you’ve addressed the drag from that if they’re capitalized and I’ve seen that ignored in other SMTA pitches as well. Also, has there been any disclosure of incremental public company expenses? Thanks!! New to your blog and very impressed with your work. Thanks. The way I'm currently thinking about the NAV -- eventually this will trade for NAV, likely by the 3 year mark when they'll collapse the management structure and either sell it, or internalize management. From their posture this isn't meant to be a permanent arrangement, so while yes in the meantime much of the current cash flow from the MTA is being swept to SRC, the collateral value is still there and will accrue to SMTA. But sure, you'll need to adjust the NAV down by 1.75x $27MM for the termination fee and however you want to handle the incentive comp. For now, it might be a dividend/AFFO yield valuation, but eventually it will move to NAV as Shopko is resolved and the reason for SMTA existing ceases. How do you think about investing in reits when interest rates are rising? Does it not affect your SMTA thesis? Rates increasing are a headwind for most REITs. For SMTA specifically, I think increasing rates will be less of a factor, the MTA debt is fixed rate and the leases in the collateral pool are mostly linked to CPI. As rates/inflation tick higher, should see some additional spread income, whether that offsets the decreasing value of the leases? Probably not. And then in the workout bucket, the value of the Shopko boxes is less about the prevailing cap rates and more about the credit of Shopko or the ability to re-lease/re-develop the property in the case of a Shopko bankruptcy. Hi there, thanks for the great post. I'm interested in SMTA rather than the parent at this point. Do you have any further knowledge on how comp will be structured for the 8% lockup? Also what's the CEOs ownership like? This looks like a compelling opportunity, do you have a sense of what the workout stuff is likely worth relative to BV? And how aggressive management is in liquidating these assets (it's probably an awful time to be selling this real estate). Thanks a lot! I haven't dug into the CEO's ownership specific to SMTA, but he would have received shares in the spinoff as part of his SRC ownership stake, so you could infer what he holds that way. All the listings are below an 8.5% cap rate, when the NAV slide provided as part of the spinoff has them valued at a 10% cap rate, could be their better assets of the pool obviously, but an interesting data point anyway. Do you have a sense of what AFFO will be like for FY18/ on a steady state level? Have you seen any guidance, in the form-10 AFFO for FY17 pro-forma was $89,908k, and Q1's AFFO was $26,930k, so it looks pretty good so far. Also, I was wondering, with respect to the $20m annual portfolio management fee, is that just for the unencumbered assets, or MTA too? I can see that MTA has it's own fees in additon, charged by Spirit Realty... So I was wondering if they liquidate the unencumbered assets if that c.2% annual NAV cost disappears. Thanks a lot! I don't have anything additional on the AFFO, but the management fee is for SMTA has a whole, you're right that they're double dipping a bit by also charging at the Master Trust level. So while the management fee wouldn't fall off automatically, I think there's an argument to be made that SMTA doesn't need to exist once the workout assets are sold, either management should be internalized or the entity should be sold. Do you know the tax implication for buying SRC pre-spinoff? I am holding SMTA right now and i am wondering if its treated as return on capital, dividend (from earnings and accumulated earning), or both? Probably best directed towards investor relations, but I believe SMTA is a taxable distribution/dividend that will then reduce your cost basis in SRC by an equal amount. But if others know for sure, please speak up, or if you ask and hear back from IR with a definitive answer please let me know. MDC - what is your take on the recent Shopko financing at SMTA? I am curious as to what they will do with proceeds. Can a portion be put into SMTA and leveraged? Will they distribute some? I did not hear a lot of clues in the recorded update from SMTA. Sorry, I meant put into MTA and leveraged (not SMTA). It seems smart to do this ahead of the holiday shopping season, last year there was a lot of worry in the market whether Shopko would survive after the holidays, this news gets ahead of that concern this time around. It's not cheap financing by any means, but it eliminates the idea the Shopko boxes are worth nothing. I assume it'll go into the MTA, that's the playbook management laid out at the spin, monetize the Shopko/other portfolio and lean into the MTA until it's all one portfolio. Shopko has announced plans to close 39 stores across the country, including one in Wisconsin. I dropped a note to company to ask how many are SMTA owned. Will report back if I hear from them. Just bumping it up against the list provided in the Form 10, looks very few of these are SMTA owned, but I could be wrong if the towns don't exactly match up between the two. These appear to be the old Pamida stores that rebranded to Shopko Hometown after the two merged in 2012, pre-dating the original Shopko/Spirit lease from 2006. It does make the financing transaction look smart in hindsight and the market isn't giving much if any value to these assets, no real reaction to the stock yesterday. My position is relatively modest today, but would look to add if the stock price really fell steeply on this news. $1 special dividend announced, plus a $50MM repurchase plan initiated. If Shopko does file, SMTA could just put the keys in the mail and that would essentially resolve the Shopko assets quickly and the SMTA structure's purpose would be done, speeds up the time from 3+ years to maybe 12-18 months. Who knows how it could trade on the news. SMTA has been trading down for the last month or so, how much of the weakness do you think is Shopko driven? Has your view on the thesis changed much? Thanks! I still have a ~$20/share of market NAV thesis in mind... but haven't been on top of it well enough. Hard to say, probably lower than that if Shopko is bankrupt, might end up just getting the $165MM mortgage they took out. The MTA is performing as expected, minus a management fee/carry, probably gets you somewhere in the mid-teens. Any idea what the large move was about 2 days ago? Thinking of topping up. Thanks! It was the regular and special dividend ex-dividend date, $1.33 in total, payable in January. Question: From our due diligence, your company looks very similar to Realty Income. Can you comment on that? Answer (Jackson Hsieh): Yes, we are very identical. It wasn’t the case 12 months ago. We had Shopko, we had some of this master trust, but you know we spun off about $3 billion worth of properties. We raised a bunch of debt before we spun off so we could deleverage our balance sheet here at Spirit. The one difference is that we generate about $42 million from the spin-off in terms of managing it and preferred investment; but to be honest with you, from my perspective, I would like that relationship to end sooner than later. Because the sooner it ends, the faster I can get investors to focus on “Spirit looks just like Realty Income”. You know Realty Income does not manage any external company, they are just a simple company running their own assets. And at Spirit, if we were to chop off just the spin-off arrangement, we would be very similar. So the sooner we can do that, the better it would be for us. That is the last 20%. We are working with the board of spin-co to say “hey guys, this is not a permanent arrangement, you guys should hire a banker, because at the end, we don’t want to do this forever, we want to get our termination fee and our preferred back to go our way.” That is my objective as the CEO of SRC. I saw that too, in the comment section it sounded like it was more a paraphrased conversations than a direct quote from Jackson Hsieh, but seems like the right path as soon as Shopko is resolved one way or another (could declare bankruptcy as soon as today from what I've seen). Its good news, let's wrap it up quick, glad to hear they're likely going to just mail back the keys on the ShopKo properties, I bought a little more today. would be an uncomfortable place without the non-recourse Shopko financing in place. Right, SRC earned their keep with that transaction, although it probably cost the $34MM term loan in the process as well. The note is a "senior secured" obligation of "Shopko". Here's hoping there is a recovery greater than $0.